Located in The Mall Bangkok, Fantasia Lagoon in Bangkok is a perfect outdoor activity for your children compared to other parks such as Dream World or Siam Park. Situated on the rooftop of the mall, this water park is built for leisure while you can shop around in the mall outlets too. 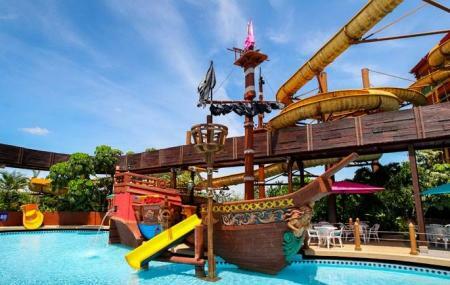 Very safe for kids to play in the area, you can spend few hours inside the park exploring plenty of water rides and activities designed for children and toddlers specifically. A big water park, this arena is not very crowded, and the rides are reasonably charged. The employees of Fantasia Lagoon are friendly and helpful at all times. How popular is Fantasia Lagoon? People normally also visit Wat Phra Kaew while planning their trip to Fantasia Lagoon. 40% of the stuff is broken or closed but the management did not reduce the price. Actually you can only go in the water but all attractions are closed like the slides and all the fun stuff. I recommend to go to another place. Fantasia Lagoon is run down so it is not worth it for 220 THB. Even this place is 10+ years, they surprised me with my last visit. They maintained this place very well and with great improvements. A lot of children came to onjoy here like an old day. Best place for outdoor swimming in fresh water. Very large pools for kids and adults.